1. Rocky II was released two-and-a-half years after the first movie. How much time has passed in the story timeline? Rocky heals, retires, gets married, has a baby, and fights Apollo again in the space of only 10 months. 2. In the hospital immediately after their first fight, an agitated Apollo challenges Rocky to a rematch. How does Rocky respond? A number of people, including Rocky, idly speculate that he has brain damage, but it's the eye that concerns doctors. 4. Who is the first person to request an autograph from Rocky? "Yo, Adrian, how about you and me go, you know, permanent." "I know it's small, but...ding, ding, here's a ring." "Would you like to be Mrs. Italian Stallion?" "I was wondering if you wouldn't marrying me too much." 6. Where does Rocky propose to Adrian? 7. Flush with money from the fight, what is Rocky's first big purchase? Rocky's first purchase is a Pontiac Firebird Trans Am, more commonly associated with Burt Reynolds. 8. Which product does Rocky agree to endorse by appearing in a commercial shoot? 9. Where does Rocky first work when he starts to run out of money? 10. When Rocky contemplates fighting Apollo again and asks Mickey for help, Mickey declines. Why? 11. Why is Apollo so eager to get Rocky to agree to a rematch? The cartoon shows Apollo holding a skinny Rocky by the neck. 13. The Balboas have a baby boy. Who do they decide to name him after? 14. Which of these real life sports reporters has a cameo interviewing Apollo during his campaign to call out Rocky? "He hit like a girl in our first fight." 16. What is Mickey's plan for Rocky to defeat Apollo this time? 17. What is the promotional name for the Balboa - Creed rematch? 18. What color is Rocky's robe for this fight? Rocky's corner wore pink in the first movie. Apollo's corner wears white. 19. How much do Rocky and Apollo weigh for this fight? 20. Which injury is the first one sustained during the fight? 21. How many rounds does this fight last? He doesn't bother to thank his wife! 23. Despite winning an Oscar for directing the first Rocky, John G. Avildsen did not direct the sequel. Who did? 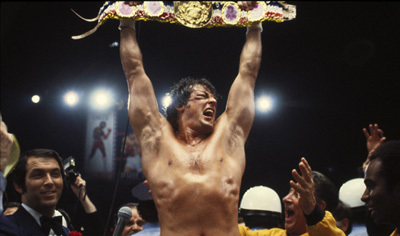 24. Who composed the musical score to Rocky II? 25. How many Oscar nominations did Rocky II receive? Despite the ten nominations for its predecessor, Rocky II failed to garner a single Oscar nomination.